The first time I hit the stage was a professional disaster but a personal win. Prior to this show, I had made some pretty good-for-me progress with traditional training. I thought I was the bomb, so I signed on to compete in my “real first” show. I got on stage thinking I was a rockstar, strutting my stuff like an Olympia Pro. In hindsight I realize that I had “first timer fever” (state of mind when you’ve initially lost weight; it’s characterized by feelings of invincibility). You make such great changes initially, its overwhelming and you are amazed with yourself. You actually believe that everyone else is amazed by you too. (actually some people are, like your mom). I was 47 years old, relatively well conditioned (I could teach hours of aerobics) and in decent shape (with clothes on) but I was fat. I just didn’t have the specialized knowledge to make the kind of changes I wanted. I kept trying anyway. I worked 4 years, albeit intermittently and without laser focus or expertise, but could not make the changes. That’s when, in total menopausal frustration, I hired a Figure Competition Coach and totally reworked my physique. The right way. 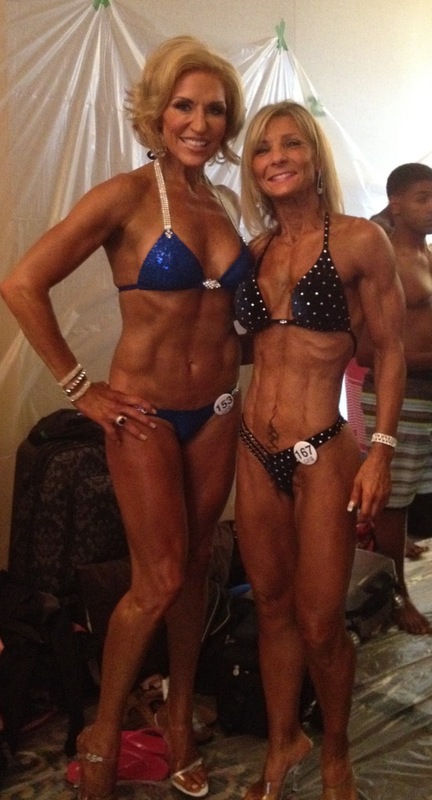 Within 3 months (I kid you not) with the proper training and nutrition, I was on stage as a Masters Figure Competitor at the age of 51. Working with a professional made all the difference in the world! Most women are interested in looking and feeling better, and that’s a great place to start! As you achieve aesthetic goals good health follows, along with improved physical performance- you get lean, feel healthy and become strong. Three Months – Dramatic Improvements. I went onstage 3 months after I began my weight loss journey and competed for 2.5 years. It was a great experience all the way around and I live the lessons and maintain the habits that I learned in that time. I’m finally comfortable at a reasonable weight, living a balanced lifestyle. The absolute best thing about training and competing is the connection you make with women, it’s all about the friendships! The most important lesson I learned by living these extremes was to find Balance Over 40. That it the most important lesson of all! If you’re ready now visit http://www.getfitover40.tv to start!